How can I achieve the best painting results? DUPLI-COLOR Alkyton is a rust-protecting, urethane-based alkyd resin system, which combines 4 products in one: Primer, rust-protection, paint and sealing. The highly covering lacquer features extremely high flexibility and resistance to impact, even during changing temperatures or bending. The high pigmentation of the lacquer results in a very good coverage amounting to 10,5 m²/l with one layer. The productive 250 ml and 750 ml brush paint cans in professional alkyd quality are suitable for big areas in industry and DIY. Universal for the painting of containers, chassis, attached parts, tractors, agricultural and construction machines, roofing, cranes, banisters, gates, constructions on ships, ductwork, etc. On request different colours are even available in bigger packaging. DUPLI-COLOR Galvinol gives a proof of its outstanding quality especially for the varnishing of specific surfaces such as zinc, aluminium, stainless steel, iron metals or other smooth surfaces. This special primer remains open-porous and produces a slightly sticky surface, which is perfect for the subsequent painting with DUPLI-COLOR Alkyton Anticorrosion Paint. For the quick and efficient repair of scratches, defects in paintwork or damages, the most popular colour shades are available as high-covering repair sprays in alkyd resin quality. 150 ml repair sprays for the reconditioning of transport-, assembly- and maintenance damages on painted surfaces. Ideal also for special applications on non-accessible spots, for example in niches or on banisters. 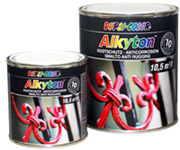 Technical Information: ALKYTON Rust Protection, Alkyton Rust Protection Repair-Spray und Alkyton Galvinol.